…so its fair to say I was sliiiiiightly nervous when it came to 6.30 that evening. The lovely lovely people at Arcadia had reserved the side room downstairs for us to use, and I started to sweat a little hoping I hadn’t completely wasted their time and done them out of a night’s takings. By 7.15, with 60 books on the table, and a packed-out venue full of amazingly brilliant people talking about their favourite books, beer and how to set up book clubs in their local area, I was already grinning madly, and a couple of hours later the tears had started stinging in my eyes at just what a brilliant, brilliant thing was going on around me. It started when we heard about World Book Night in November. I instantly applied to be a giver for what I believe to be a great incentive to get people talking about books. Twenty Five Titles, 48 copies each, given out by 20,000 people up and down Britain, with massive support from writers such as Margaret Atwood and Alan Bennett, this was always going to need a bigger boat. When I found out The Travelling Suitcase Library had been selected to be a giver of “Stuart: A Life Backwards” by Alexander Masters (thoughtfully and eloquently told real-life story of a man who is homeless and stimulant dependent, fighting for his rights in a world that seem designed to go against him) I was jumping for joy a wee bit. 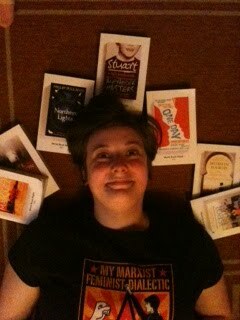 A few shout outs on Twitter and I soon realised I wasn’t alone in wanting to share the books with others. Together with Lauren (@walkyouhome) and Alice (@bulbnose) we decided to gatecrash Arcadia for the night and give out the books we had chosen (Love in the Time of Cholera by Gabriel Garcia Marquez for Lauren, One Day by David Nicholls for Alice) to the locals and regulars that frequent the CAMRA pub of the season. Then, when I toddled off to ask the amazing management of Arcadia if I could borrow a table for the evening, I found that there had already been some interest. A Random Man had apparently asked if he too could give out books. Then R the manager heard from her old friend Paula that she too was looking for a base to give hers out. It was all getting a bit big. Come Saturday I had no idea if we could pull it off. 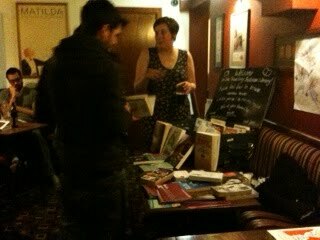 Having promoted the evening in some online publications I know I still wasn’t sure how it would go; an awful lot of people say to me “what a marvellous idea” when it comes to the Travelling Suitcase Library, but enough to fill a pub on a Saturday night? At 7 there was mine and Alice’s books on the table. These were soon joined by ten copies of The Reluctant Fundamentalist by Mohsin Hamid given by the absolutely gorgeous Steve, who had given the rest to his rugby team that day in an effort to bring his hobbies together. At 8 Paula arrived, her brown box full of copies of Toast by Nigel Slater, greeted by cheers. The Travelling Suitcase was open throughout and about ten people brought books to be swapped. When my very good old friend M arrived with a bag full of graphic novels I had barely time to read out the titles before they were snatched from my hands. People were talking passionately about their preferences. Whether this was aided by the venue’s excellent choice of beers and wines I couldn’t comment, but the couple of pints of Black Velvet definitely loosened my tongue! 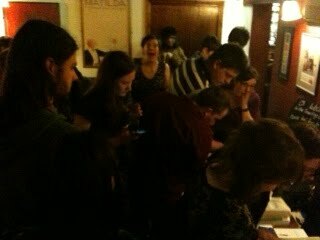 I popped upstairs to announce “free books” and we suddenly had about fifty people clawing their way to the table to get their hands on copies. When Kelly pulled out copies of Case Histories by Kate Atkinson to contribute to the hoard they lasted, what two minutes? When Lauren arrived (after moving house!) 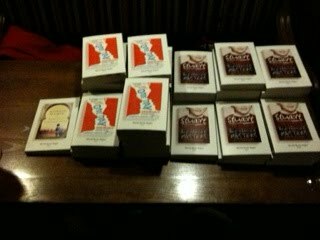 with 48 fresh copies of Love in the Time of Cholera she was greeted like a hero. And then, at about 9, just when it couldn’t get any better, Rebecca arrived. She’d read about the event on the World Book Night website, would it be alright to give out her 48 brand new copies of Northern Lightsby Phlip Pullman? I almost cried. 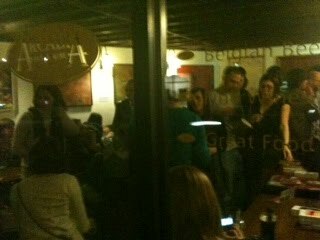 Standing room only at World Book Night! 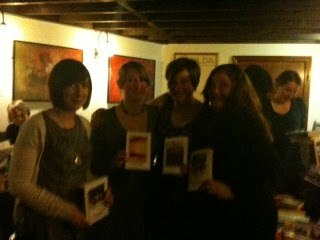 I must have spoken about reading to 80-odd people that night, including a rather socially relaxed conversation with three rather nice young men about how they should definitely take a copy of Northern Lights (which only one of them had read, and whose reaction to hearing his friends hasn’t was far to explicit for me to repeat) and use it as a chat up line during their night on the town. It also turned out G, the deputy manager of the pub, hadn’t read it either, which astounded me but I’m now really looking forward to discussing the series with him! My face in the crowd at about 8 o’clock… says it all really! This is what I love about books, they really do bring people from all walks of life together. Yes we were all adults, but students, locals, regulars and staff came together to talk about something they love and that should be celebrated. My favourite part of the night was possibly when regular Barry walked out with two books, and a massive grin on his face. It was also a pleasure to see a couple arguing massively over why she should take more books. “You already have five shelves!”, “Oh really, and what about all your cricket gear?”. Classic. As the night wound down, and the good 400 books that had been given away from both the World Book Night haul and The Travelling Suitcase Library were packed carefully away into bags and coat pockets, we reflected on what we had done. Many people had said they would now be joining the book club, many more people have talked about the need to create one of their own. All in all I couldn’t have been more pleased with how the night went, I just hope that everyone who came was inspired, and enjoys their new books! To R & G, the management, for continued love and support. Could not have done any of this without you. To N, who has just been an utter utter rock. Bigger and better things next time! To L, M, J and A for being there. Thank you. 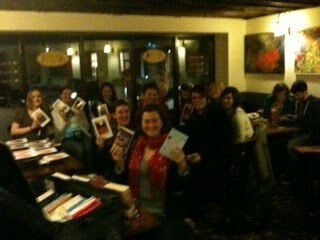 To Lauren, Alice, Rebecca, Paula, Kelly and Steve the book givers who shared there passion and books with us. It would have not been half as amazing without. To the word “amazing” that apparently sponsored this blog post! ‹ PreviousBook Club the Bigger! Meeting the first!